- Took me a moment to notice the 'pile of sand = crab' thing... although I guess that's just me being silly, but maybe make it slightly lighter/glowier than the normal sand to make it more obvious? I love the pixel art style of the clouds. A kind of sloppy MSPA-esque style. I appreciate the effort put into the foreground assets as well. I'd like to see a game done all in the clouds style. The black outline on the sand sticks out against all the other pixel art styles. I know borderless pixel art is a meme right now though. 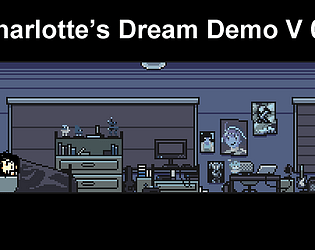 Charlotte feels a bit too slow for her sprite animation speed. Overall the movement feels stiff somehow. I don't think it calls for adding inertia when walking or anything. It could just be coming from that slow walk speed. Really cute! I think the gameplay really slow unless you're running, but that turns it into a frustrating runner-style game. A few more checkpoints could be nice too.